When I embarked on the train to Watford, the carriage was packed with people in costume on their way to the Harry Potter experience. All I could see of the person a couple of rows in front of me was a crooked hat. On arrival at Watford Junction, I had somewhere more important to go. My usual walk to the West Herts took a slight detour as I entered Cassiobury Park on a mission to find GT’s bench. It wasn’t long before I spotted a brand new bench in a little oasis and I headed over. I was disappointed to find someone already there, but gratified when I noticed the Watford top and we soon fell into conversation. 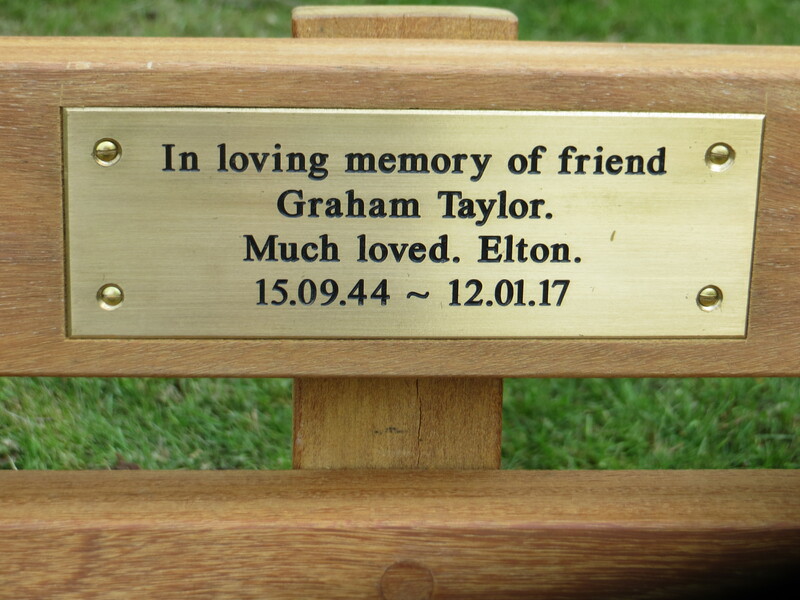 As we sat there, a number of people came past and commented on what a lovely gesture the bench was, the Watford fans among them taking the chance to have their photos taken and to remember the great man. After paying my respects, I headed to the West Herts for the last pre-game drinks of the season. Top of the agenda was Mazzarri’s sacking. Most in attendance were happy at the news. While I can’t say that I was a big fan of the football we’ve been watching for most of this season, I can’t help feeling that Mazzarri was a little hard done by. By all accounts Flores was dispensed with as he was too soft on the players. Mazzarri had come in to instil some discipline but, very much like Sannino, his methods did not find favour with the players, which seemed to lead to performances well below the standard that should have been expected from a squad of that quality. The other discussion surrounded Holebas who was on track to achieve a premier league record of 15 bookings in a season. Of course, this would lead to him missing three games at the start of next season although, due to a bizarre loophole, I was assured that, if he was booked twice, he would only serve a one match suspension. I found that difficult to believe. Team news came through and our problems in central defence were highlighted by the fact that Mariappa was the only recognised central defender in the team. There was worse news soon after when a correction was made removing Mariappa from the line-up with Behrami filling his position in the back line. 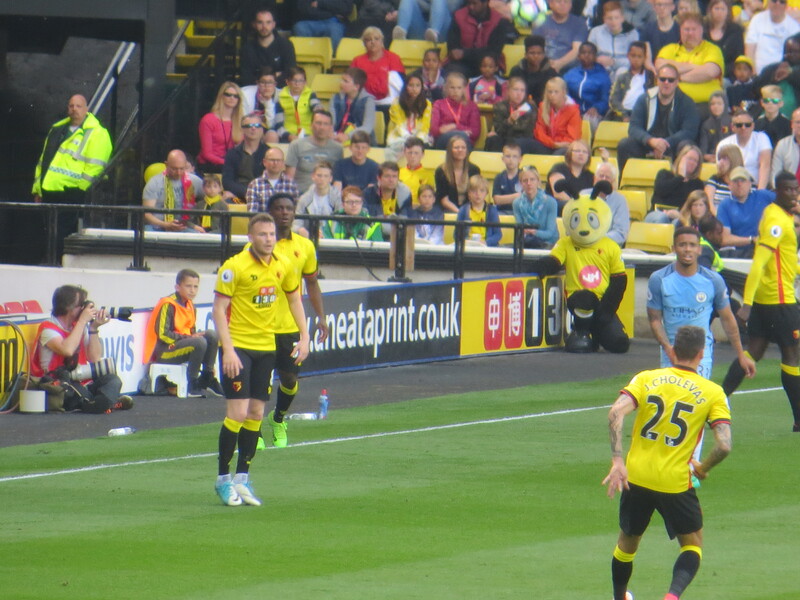 As if that wasn’t enough to provoke discussion, Deeney had been left on the bench where he was to be joined by both Pantilimon and Gilmartin. Mazzarri was going out in style! So the starting line-up was Gomes; Janmaat, Behrami, Holebas; Amrabat, Cleverley, Doucouré, Capoue, Mason; Niang and Okaka. There was almost a disaster in the first minute as Gomes delayed a clearance, he lost out to Agüero who crossed for Jesus whose header was cleared off the line by Holebas before the danger was cleared. But the respite was brief and the Hornets were a goal down on 4 minutes as a corner from De Bruyne was met by Kompany who was allowed a free header to finish past Gomes. After witnessing constant pressure from the visitors in the first 10 minutes, it was a relief to see a Watford attack, although it finished with Niang cutting inside and shooting just over the target. It appeared that a second City goal was inevitable when Jesus broke down the left and squared the ball for Agüero who had an open goal to aim at, but Behrami put in a terrific tackle to avert the danger. Gomes then pulled off a terrific save to deny Agüero from point blank range. But the Argentine wasn’t to be denied for long as he latched on to a through ball from De Bruyne and finished clinically past Gomes. Soon after there was a rousing chant for Troy Deeney who, at the time, was sitting somewhere towards the back of the bench. Gomes was in action again claiming a ball over the top from Otamendi as Silva challenged. Mason incurred the wrath of the referee, although escaped a booking, after sending Jesus into the hoardings. The first sight of Deeney warming up was greeted with a standing ovation, which was as much anti Mazzarri as it was pro Deeney. The visitors claimed their third on 36 minutes as Sané broke down the wing before squaring the ball for Agüero to score his second. Watford’s defensive woes continued as Janmaat went down with an injury and had to be replaced by Eleftheriou, who was making his Watford debut in the worst possible circumstances. The fourth goal came as Fernandinho exchanged passes with Agüero before holding off the challenge of Mason and finishing past Gomes. The goal was greeted with boos and streams of people heading for their half-time refreshments or, possibly, the exit. 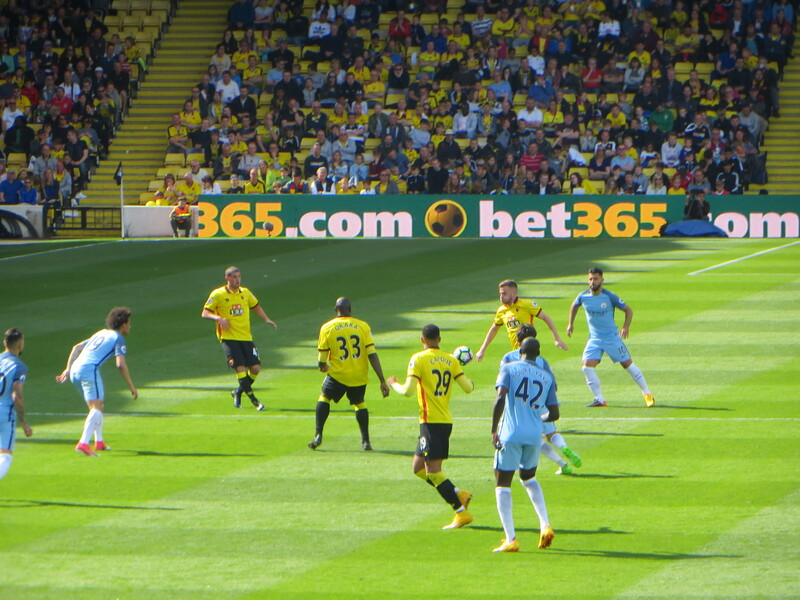 The first caution was earned by Doucouré for pulling Agüero back. The resultant free-kick was blocked for a corner from which the ball was cleared to Agüero who, thankfully, shot wide of the near post. The half time whistle went to loud boos. It was noticeable that Deeney spent the break warming up, he appeared to be doing it off his own bat rather than training with a coach. The half time distractions included a brief interview with Bill Shipwright, a defender from the 50s, who did the half time draw. Also the introduction to the crowd of Chris Williams, a steward retiring after many years of service. Sacred Heart beat Bushey Heath in the penalty shoot-out which gave us some excitement as it went to a sudden death finish involving the goalkeepers. It was all a pleasant diversion from what had been an abysmal half of football. The seats behind me were occupied by a father and two young children, who were friends of the season ticket holders who have those seats. There had been a number of incredulous questions to the father about why he was still supporting Watford in the game and why the players weren’t trying (slightly unfair given the opposition). So I was disappointed that they were still in the concourse when Watford had their best chance of the game as Okaka went on a run and blasted the ball at Caballero who pushed it out for a corner. There was another chance for the home side as Fernandinho lost out to Niang whose shot was deflected into the side netting. City’s fifth goal came just before the hour mark as Cleverley failed to clear a cross from Agüero, Jesus lifted the ball over Gomes and it hit the net despite Eleftheriou’s best efforts to head it off the line. 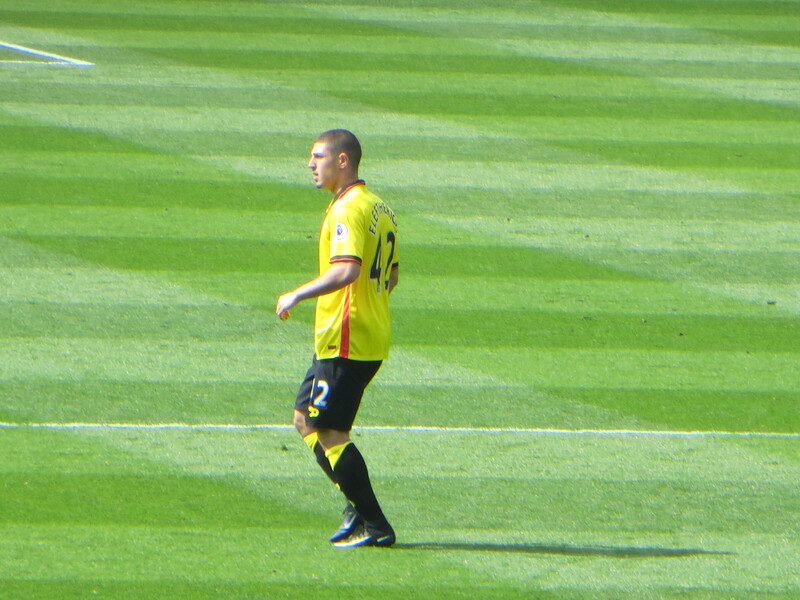 Before the restart Deeney replaced Amrabat. Agüero’s chance for a hat trick was stopped with a tackle from Behrami. The crowd’s chants against the head coach continued with “Walter Mazzarri get out of our club.” City made a double substitution bringing Navas and Sagna on for Touré and Sané, leading one of my neighbours to quip, “They’ve gone all defensive, they ‘re scared of us.” Agüero threatened again with a shot that was tipped over by Gomes. At this point, there were chants for Rene Gilmartin, which were certainly not a judgement on the performance of the incumbent in goal. Gomes denied Agüero again dropping to block and getting injured in the process. What a relief that there were two goalkeepers on the bench. Despite the chants for Gilmartin, it was Pantilimon who readied to come on but, after treatment, Gomes was fit to continue. 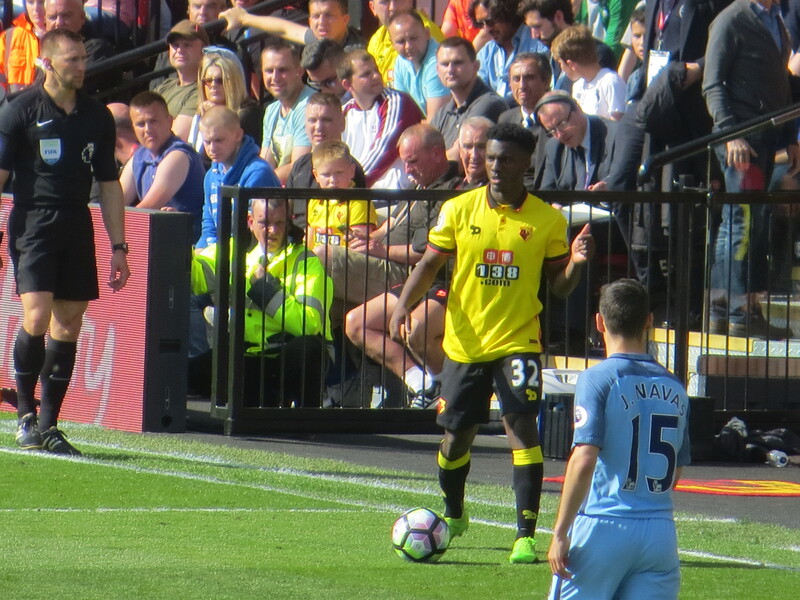 With 20 minutes to go, Agüero left the field to applause from all corners of the ground after a tremendous showing, he was replaced by Iheanacho who was wearing 72, so was greeted with a chant of “One Graham Taylor.” As we reached the 72nd minute, the influence of GT was felt as the Watford players suddenly sprung into life. Doucouré came close with a shot that was cleared off the line. Then a Capoue shot was blocked, the ball fell to Okaka who had a chance to score from close range, but he was being challenged so couldn’t get a clean contact and the ball bounced off him into the arms of Caballero. Watford’s final substitution saw Pereira come on for Niang. The youngster gave the Watford crowd a brief moment of joy as he combined with Eleftheriou on the overlap, but the cross was cleared. As the clock wound down, there was little on the pitch to amuse the 1881 so their attention turned to Thierry Henry who was in the corner next to them waiting to do the post-match summary for the TV, and was serenaded with chants of “Sign him up” and “Henry for Watford”. It was a relief when the final whistle went and, as a soppy old woman, I was pleased that enough people stayed for the “lap of appreciation” to make it worthwhile. Troy’s daughter, dressed in her tutu, was performing for the cameras and I was happy to see that the person who wanted a word with Troy at the end appeared to be congratulating him. Both Heurelho and Troy said a few words, but they were understandably downbeat and I think we were all happy to see the season come to an end. Back to the West Herts and there were some heated exchanges between those who had left promptly on (or before) the final whistle and those who stayed to applaud the team. With Watford having nothing to play for and City needing the points, this was always going to be a difficult game, but for many it was the final straw after the six successive defeats that followed our achievement of 40 points. Added to that, the fall from mid-table to just above the relegation zone in a season when we were never really in a relegation battle had angered a lot of people. It is such a shame that this season will be looked back on with such disappointment. There were certainly highlights. Those who travelled to Arsenal and West Ham or saw the home game against Man United will cherish those memories. But, ultimately, despite retaining our place in the top division, it was not a season to remember. It remains to be seen who will take charge of the team next season, since neither the iron fist nor the velvet glove seems to have worked, let’s hope that Gino can find a coach who can strike the right balance between the two approaches. Despite how thoroughly fed up I felt after the game, it won’t be long until I am counting the days to the release of the fixture list and the start of pre-season. Head coaches come and go, but the fans who go week in, week out will still be there cheering the team on. Let us hope that there is a lot more to cheer next season. This entry was posted in Watford FC and tagged Abdoulaye Doucoure, Andrew Eleftheriou, Bacary Sagna, Brandon Mason, Daryl Janmaat, David Silva, Dion Pereira, Etienne Capoue, Fernandinho, Gabriel Jesus, Gael Clichy, Heurelho Gomes, Jesus Navas, Jose Holebas, Kelechi Iheancho, Kevin De Bruyne, Leroy Sane, M'Baye Niang, Manchester City FC, Nicolas Otamendi, Nordin Amrabat, Pep Guardiola, Sergio Aguero, Stefano Okaka, Tom Cleverley, Troy Deeney, Valon Behrami, Vincent Kompany, Walter Mazzarri, Watford FC, Willy Caballero, Yaya Toure on May 22, 2017 by franelynn.